In the era when families are spread through the U.S., I suppose my family was quite an anomaly. So much so that in later years my grandmother would often remark, “I must have done something wrong – I just can’t rid of you kids!” Of course, all of us “kids,” now well into adulthood with families of our own, knew she was fiercely proud of her loyal brood of children and grandchildren. Her life had been spent raising her three daughters, and then, spending her mid-life and senior years doting on her six grandkids. Reflecting back, I now realize I took my childhood for granted, and assumed that all kids had wonderful grandparents and extended families. In many ways my grandmother was a second mom to me – she certainly was just as important to me in my growing years, and helped mold me into who I am today. One would think she had been privileged with same joy as a child; however, as the off-spring of more mature parents, she did not have the advantage of a grandma or grandpa in those early years. However, she spoke of her many aunts and uncles, most of whom were considerably older than her parents. Aunt Georgiannna Stanwood Cravens, her mother’s older sister by 13 years, was the closest she had to a grandmother. She once said her cousins were more like aunts and uncles due to the age difference. At thirty-six, great-grandma Susie, my grandmother’s mom, was no spring chicken when she gave birth to my grandmother, Goldie Simpson. Susie had been married once before to Edwin Clark and had one daughter, my grandmother’s half-sister, from that marriage. She was a junior by 16 years to Ernest, my grandmother’s father. Great grandpa Ernie had been married twice before exchanging vows with Susie, and had three children from his first marriage and six from his second; however, my grandmother, “Grammer,” never recalled meeting any of her older half-siblings. Grammer wrote, “He completely, worshiped my mother, and I was bathed in the same sunshine, perhaps because I was hers, yet bearing the blackness of his eyes and hair.” Years later she would recount stories from her happy childhood; due to the age difference between her and her older sister, Beatrice, in many ways Grammer was an only child who did not have to share the affection and attention her parents showered on her with other young kids in the home. What never did reflect in her stories, however, was the incredible pain I’m sure she must have endured in the early loss of both of her parents. In 1939, while only a girl of 17, Grammer’s father Ernie died from prostate cancer. How difficult that must have been for her, but the loss was compounded when her mother died suddenly of a heart attack just days before Christmas in 1946. My own mother recalls this event as the earliest of her childhood, having adored Grandma Susie. Clearly it was a somber Christmas without holiday cheer. I have to imagine the next few months and years were very difficult for Grammer, a young woman having already buried both of her parents. My grandmother’s obvious love of life and resilience helped her through those years, as well as her close relationship with her older half-sister, Auntie Bea. After my grandmother’s death in 2004, Bea’s daughter Pat shared many stories with me of my grandmother’s youth and early adult years. Vivacious and active, she had many would-be suitors, including a well-known Minnesota DJ more than thirty years her senior. (Cousin Pat recalled this did not meet with her family’s approval!) Despite her many beaus, Grammer married young. On March 24, 1940, she and my grandfather Harold T. Uphouse exchanged vows. While many photos of the newlyweds capture the happiness of their young love, it apparently did not last. By 1955 they’d divorced, leaving my grandmother alone as a single mother with two young daughters. Never one to be easily overcome by life’s challenges, my grandmother later would reminisce, describing this period of her life as her “bachelor years.” Clearly this was a happy time, as my mother also fondly recalled the years after her parents’ divorce. One has to admire such a courageous woman, who, without a college education, not only set out to raise and support her children, but to help them find joy in life despite its challenges and adversities. Gramper was a marine, and served in both the Korean and Viet Nam wars. This was not my grandmother’s first experience with a husband serving his country overseas – Harold was a WWII veteran. Still, I cannot fathom the worry and fear that filled her mind with Cecil gone. She later told me it was just something that they didn’t talk about – it was always assumed he was coming home and that was that! An active and eager parent, Grammer showed no less enthusiasm for her role as a grandmother. Her two older daughters each blessed her with grandchildren the very same week. I was born first (and as a child always delighted in the fact I was the oldest of her grandchildren!) and two days later, my cousin J.H. was born. Throughout my childhood, beginning with pictures of my first Christmas, birthday, and special occasions, we always celebrated at the home of my grandparents. It is there that most of my fondest and earliest memories were formed. 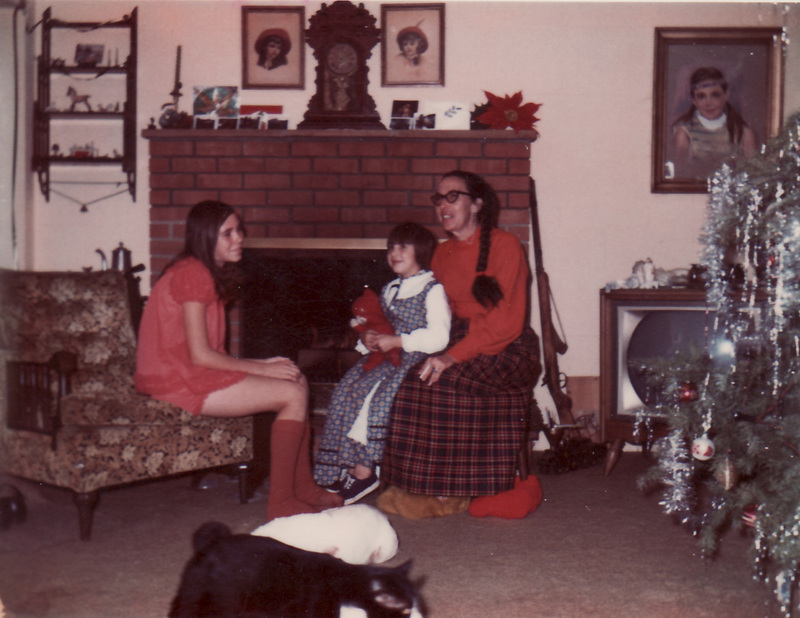 Sitting on my grandmother’s lap, about 1969, with my aunt on left. It is no surprise that my very first memory involved my grandmother. Not only did she care for me while my mother was at work, but she always enjoyed the many hours we spent together. As a very small girl, I was quite enamored with Grammer’s very long hair, and would sit next to her and carefully brush the long black strands. Perhaps two or three years of age, it occurred to me that Grammer should pin her hair up. Without sharing my plan, I darted off to the kitchen to look for a suitable tool to create a bun. My grandmother must have overheard my rumblings in the kitchen drawers, for when I returned to the living room she was quick to inspect my tiny little hand, in which she found a thumb tack. For many years to come we laughed about the hole she’d have had in her head had my toddler’s plan come to fruition! My grandmother had an uncanny ability to see the world through the eyes of a child. Just as she had for her daughters, she always seemed to find ways to make my world a little brighter. Born with an orthopedic disorder, the doctor ordered me to wear leg braces. As I grew, the braces were shed but replaced with ongoing strengthening exercises. Even this was a game to Grammer, who would lead me about the house like a mother duck, quacking about and doing the “duck walk,” a term we coined as we’d turn our feet outward and walk like ducks. Having been very ill as a young girl, my grandmother was exceptionally sympathetic whenever I’d catch a cold or had the flu. When six or seven years old, I clearly remember being very sick for several days. Instead of staying with Grammer, I was at home being nursed by my mother when my grandmother called. My excitement rose when mom shared that my beloved grandmother was coming to see me. In typical fashion, Grammer was armed with an array of items designed to distract me from my ailment. To this day, I can’t see a paper doll without thinking of my grandmother’s tireless efforts to ease my discomfort. My lifeline, confidante, and best friend was my grandmother. When things at home were tough (which was often in the months immediately preceding my parents’ divorce), I’d call Grammer. Though I’d spent most of the afternoon already with her and would go home after my mom was off work, Grammer would gladly interrupt whatever activity was occupying her time to sit with me on the phone and talk through whatever was bothering me. I could share anything with my grandmother. My grandmother influenced many areas of my life, not the least of which is my diet. She had many opportunities to do so, as I was taken to my grandmother’s home in the morning, where I’d ride the school bus to and from her home. Breakfast generally consisted of pop-tarts and hot cocoa, followed by milk and cookies after school as she would patiently help me with my homework. As I got a little older, Grammer introduced me to coffee – now a lifelong love of mine! Kept in a canister on her kitchen counter, I was given the treat of carefully opening the new can of coffee and refilling the canister when empty. To this day the smell of a fresh can of coffee brings up precious, childhood memories. The love of reading has been a hobby passed down through the generations of our family. My own family budget includes a reading allowance for both my son and I, and is especially important in this technological era which provides instant gratification through eBooks, Kindles and Nooks! As a child, my mother ensured I had an ample supply of books, and each night would read to me at bedtime. This tradition, no doubt, was part of her own childhood, and included in my son’s. It is no surprise, therefore, that my grandmother was an avid reader who introduced me to many classic novels as I advanced from children’s books to older reading material. Grammer constantly amazed me with her endless vocabulary and ability to solve even the hardest crossword puzzles. Like her father before her, Grammer loved to write poetry. With a wicked sense of humor (also inherited, no doubt), her prose contained puns designed to inspire laughter. Others, of a more serious nature, revealed a mother, grandmother, wife, animal lover. Thankfully, Grammer’s literary efforts and short stories survived the years and are included in my most precious family documents. They provide a glimpse into her life during a time when I was too young to remember or understand the thoughts and activities of the adults around me. They also demonstrate her exceptional talent. While I have inherited her love of the written word, I only wish I’d also been blessed with her artful skill in crafting words to capture the reader’s attention. I credit my grandmother’s fascination with her own family history as the impetus for my lifelong passion for genealogy. Grammer would relate the countless hours she spent with her own grandmother’s ancient photo album, absorbing the history revealed with each old photo of her aunts and uncles, grandparents and other relatives saved on the album’s pages. Now quite weathered and worn, it is one of my most precious possessions. Grammer kept many other family momentos, items overlooked by most people but treasures to a genealogist. These, along with details my grandmother would share with me about our family’s heritage, provided the basis for my earliest genealogical research. Before the days of the internet, I’d spend hours at the National Archives or Family History Centers while Grammer would babysit my son. Returning back to her home, we’d go over that day’s finds and form our theories of how the various individuals discovered on censuses fit together and were related. She seemed to enjoy my hobby as much as I did; I know for sure that having her to share it with made my research all the more special. Grammer was sharp as a tack, even at the end of her life. She had accurate details that were verified on her mother’s side of the family, and thirty years after her divorce was able to conjure accurate recollections on Harold’s family to help me begin to research his lineage! Therefore, it is quite puzzling how she changed her perception of her own ancestry sometime during her mid-life. Four years after her father’s death, my grandmother recorded Ernest Simpson’s birth as Clark County, Wisconsin, a fact which was verified years later as I studied censuses, her father’s pension requests, and other documents which he personally drafted. (He was never able to secure a birth certificate –not unusual for those born in 1869.) One of her many stories she wrote circa 1960 about her family and childhood included a small but important detail – she described her father as having Welsh ancestry. Sometime in her later years, however, Grammer was adamant her father, Ernie, was born in South Dakota, the illegitimate child of an Indian woman who’d had an affair with her grandfather, George. She stated George had taken the baby home to raise with his wife, keeping his true nationality a secret due to the prejudice against Native Americans in that era. 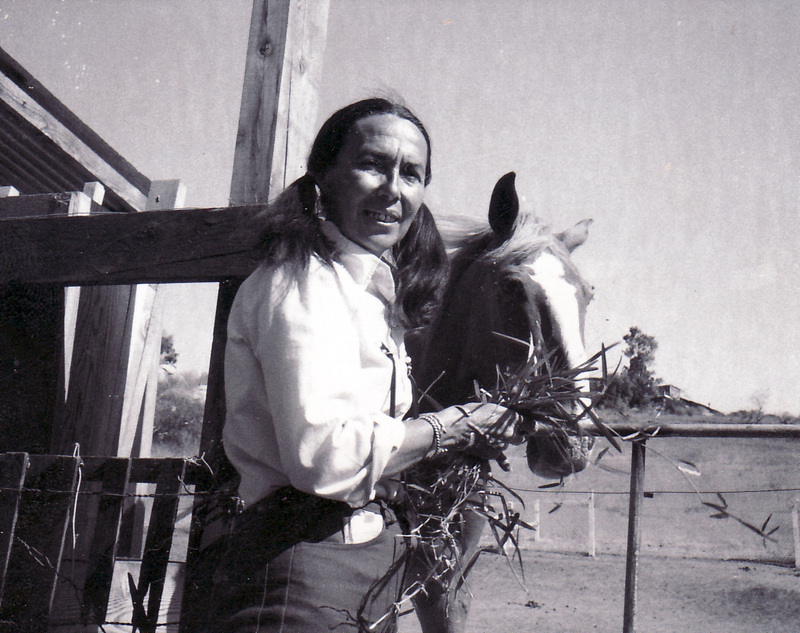 Whatever triggered this change in her perception of her ancestry was very real to my grandmother – she began to decorate her home with various Native American collectibles, proud of what she thought was her own Indian heritage. Unfortunately, however, I was the one to burst Grammer’s bubble. Census records and other documents show that George had been married since 1845 and was still married to Achsa, who appears from all documents to be Ernie’s biological mother. When I began researching Grammer’s father’s family, I quickly learned I’d need to keep those findings to myself, and let her hold on to her belief which had clearly impacted her own self-identity. Grammer, if she was still living today, would not be pleased to hear that my recent DNA test showed that our family has no Native American blood. I guess I would have kept that to myself, too! As I reflect on my grandmother’s life, and decide on a fitting final paragraph in a tribute to the person who most influenced my life, I realize it is difficult to sum up one trait that I admire most. But then, after continued pondering, I realize it’s not so hard at all. My grandmother taught me many things – her love of coffee, cookies and sugar (okay, not so good! ); love of books and reading and writing; a passion for history and family and a desire to know where I came from. However, the most important lesson was not so obvious. My grandmother has now been gone seven years. Two years after her death, my mother died, and last year, my father joined them both. The lesson my grandmother taught me through her life is not to be sad at what I no longer have, but to be extraordinarily grateful for the many years I was blessed with such wonderful family. My grandmother may not have been famous; she did nothing in her life worthy of memorializing in the traditions and annals of history; however, she gave me unconditional love and a foundation to take me through life. If everyone had a grandmother like mine, the world would undoubtedly be a better place. This entry was posted on Saturday, February 26th, 2011 at 10:14 AM	and tagged with Simpson, Uphouse and posted in My Family Lines. You can follow any responses to this entry through the RSS 2.0 feed. « Why Genealogy? And the pictures that started it all! Good to hear from you Pat! Thanks for the kudos on the blog. My grandmother was one neat lady. Would love to finally meet some time! Hope you make your way back to So. CA some time!